There’s a fantastic article this weeks’ Spectator entitled ‘God’s management consultants: the Church of England turns to bankers for salvation‘. It’s the sort of piece that is bound to send many clergy and lay members of the Church of England into a big flap, accusing Justin Welby of attempting to turn their beloved church, with all of its woolliness and eccentricity, into an efficient and hard-nosed organisation full of managerial types who have more interest in numbers and ‘talent pools’ than theology or the pastoral wellbeing of parishioners. Officials call it urgency; critics say it is panic. The Church of England, the thinking goes, is about to shrink rapidly, even vanish in some areas, unless urgent action is taken. This action, laid out in a flurry of high-level reports, amounts to the biggest institutional shake-up since the 1990s. Red tape is to be cut, processes streamlined, resources optimised. Targets have been set. The Church is ill — and business management is going to cure it. This is an approach to the running of the Church of England that takes it into unchartered waters, but given that Justin Welby is the first Archbishop of Canterbury with a business background, should we really be that surprised that he is drawing on his own experience alongside that of a number of high-flying city executives to give this large and complex institution a good shaking? The thing is that at one level Christianity is deeply personal: it is all about an individual’s acceptance of salvation through Jesus Christ and the resulting intimate relationship with God that it is capable of leading to. But on another level it is fully corporate, as believers are commanded to meet together regularly in fellowship as the Body of Christ, which is the Church. Any family that seeks to avoid constant chaos needs to establish rules and structures in order to get on well together and manage their available resources. The bigger the family, the more important good management becomes. Back in January of last year I wrote about this at my ‘God and Politics’ blog, likening the Church of England to a declining multinational still living on its past glories and fading reputation. I made it quite clear that in order to turn around its fortunes it would need strong leadership and structural overhaul. It became one of my most read pieces, but also one of the most criticised, with much of the backlash coming from clergy who refused to see the church in this way or were baffled by the description. Too often it would appear that they considered empowering leadership and structural planning to be alien concepts. Acting in this capacity was not what they had in mind when they were ordained. I was told enough times that Jesus didn’t describe his Church as a business, and to see it that way is fundamentally wrong. However, if you turn to what Paul has to say about the make-up of the Church, you’ll see this is far from being the case. In 1 Corinthians he gives a list of roles: teachers are ranked third after apostles and prophets; administrators get a mention, but pastors don’t get a look in (although they are added in Ephesians 4). Apostles are the entrepreneurs of God’s kingdom, planting the gospel in new ground and building the Church. Prophets make sure the Church sees God’s plan and stays firmly focused on it. The gift of administration (kubernesis) is not about organising rotas or producing newsletters; it is about governance. Administrators have the position of overseeing strategic planning, execution, enablement, change and resource management in order to steer the Church towards its God-breathed vision. If the Church is led only by pastors and teachers, decline is inevitable because there is no balance in leadership and key gifts that are there to grow the Church are disregarded. Unlike some sceptics, Justin Welby sees hope for the Church of England. Numbers, growth and success are not dirty words because genuine growth as opposed to transfer growth, where people move from one church to another, can only happen when new believers come to faith. Jesus talked about this growth as an absolute certainty. Why should we treat it any differently? For some critics, though, that goal is the heart of the problem. Linda Woodhead, sociology professor at Lancaster University, says an obsession with thriving congregations represents a narrowing of the Church of England’s vision. The vision, she says, is that of Holy Trinity Brompton (HTB), the super-successful church in west London. ‘What’s happening is the Alpha-isation of the Church,’ she says. No attention is being paid to those Anglicans who don’t go to church at all. Ignore these people, who still care about the institution and feel part of it, and ‘you can’t remain a national church’, she says. Woodhead may be a well-respected social scientist, but when it comes to where the CofE should be heading, she is profoundly misguided. What sort of a national institution would the Church of England be if it neglected those who are carrying out its primary purpose and paid more attention to others who have a nominal attachment to it, at best? A work of the Holy Spirit is taking place in the nation. And not just in the Anglican Church; actually some of the biggest churches now are not Anglican. You think of Life Church in Bradford, Audacious in Manchester. Think of some of the Newfrontiers churches, the Vineyard churches, Pioneer churches. I do think there’s an amazing thing going on. It’s almost like a hidden revival is going on. 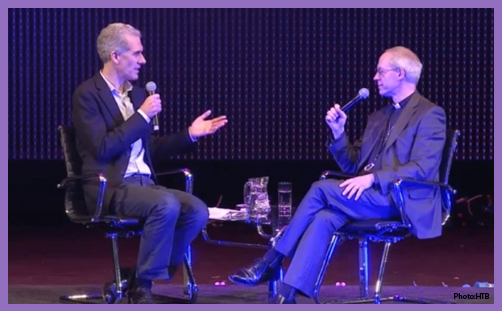 Justin Welby was once a member of HTB and knows there is great potential to be found in the Church of England. He sees the need for change if it is to not just survive, but flourish. He also knows that for that to happen, things most definitely cannot stay as they are, and after decades of denial and procrastination, some urgent measures are needed. He describes himself as a spiritual magpie, drawing inspiration in his faith from different Christian traditions. He is equally happy to take the best of what he has seen outside of the church and adapt it for the needs within it. These are not the dealings of a misguided amateur. Those who doubt what he is working to achieve or demur from some of his more unorthodox methods should think carefully about their own understanding and motives before issuing harsh judgements. If it is a stark choice between Linda Woodhead’s prosaic plan for the Church of England or the Welby-Gumbel vision for holiness, transformation, revival and growth, I know which I prefer.